The twentieth century is known as a century of martyrs. Millions of people gave up their lives for Christ. 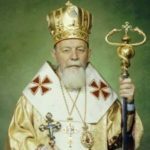 In the Soviet Union under the atheistic regime many Christians, especially Ukrainian Catholics laid down their lives rather than deny Jesus Christ and His Church. Honoring this sacrifice, Pope John Paul II beatified a number of martyrs for the Ukrainian Catholic Church on June 27, 2001. Among the martyrs was Nicholas Charnetsky and his twenty-four Companions. They all shared their martyrdom under the Soviet regime, mostly during and after the Second World War. Among the Companions was the Redemptorist Bishop, Vasyl Velychkovsky. Blessed Vasyl was born into a priestly family in Stanislaviv, now called Ivano-Frankivsk, on June 1, 1903. His father was an assistant at the Cathedral where Vasyl was baptized. His family soon moved to the village of Shuparka near Borshchiv. Here Vasyl was raised and educated, mainly by home schooling. The First World War interrupted his studies. In 1911 during a mission at his grandfather’s church in Probizhnia, young Vasyl was dedicated to the Mother of God. Throughout his life he referred to this event as pivotal, since he always sensed himself under the protection of her loving care. After becoming a Redemptorist, he promoted devotion to our Mother of Perpetual Help with every mission he conducted. The rosary for him was a pillar of strength throughout his imprisonment. After the War Blessed Vasyl completed his high school and entered the Major Seminary in Lviv. After being ordained a deacon by Metropolitan Andrij Sheptytsky, Blessed Vasyl entered the Redemptorist novitiate in Holosko in 1924. On October 9, 1925 he was ordained in the chapel in Zboisk to the priesthood by Bishop Josyf Botsian. The following two years he taught at the minor seminary, but his heart was in preaching missions. Recognizing his gift of preaching, he was soon assigned to the missions, first in Stanislaviv and in 1928 to Volyn. In Volyn he worked out of Kovel among the Orthodox faithful, who wished to join the Catholic Church, and among Ukrainian Catholic immigrants from Halychyna. Here he had much success. His sensitivity to the ways of the eastern Orthodox made him dearly loved by the people. Unfortunately, political strife between the Poles and the Ukrainians caused him to leave Volyn in 1935. He returned to Stanislaviv where with other Redemptorists he continued his parish missions. He went from village to village preaching a two week long Redemptorist Mission. He preached to hundreds of thousands of faithful. When the Second World War began and the Soviets first occupied Western Ukraine, Blessed Vasyl was in Stanislaviv serving in a thriving Redemptorist mission church. His heart went out, especially to the poor country folk that came to the city to earn a living. In 1940, on the feast of our Mother of Perpetual Help , while the city was occupied by the Soviets, Blessed Vasyl dared to have a procession of 20,000 people through the streets of Stanislaviv. After the procession he was arrested. Fearing the people who were ready to shed their blood for him , the Soviets released Father Vasyl. Since he had experience working with the Orthodox, he was sent by Metropolitan Sheptytsky to Kamianets Podilsk in Greater Ukraine in 1941. At that time the city was under German occupation. There, as in Volyn, he experienced a great spiritual revival. However he was forced to leave as his life was threatened by the German army. In 1944, Blessed Vasyl volunteered to go to Ternopil even though the Soviet front had already arrived. Amidst the shelling of the city, he did his pastoral work courageously and boldly. After one year of interrogations and tortures in the KGB prison in Kiev, he was finally sentenced on June 26, 1946 to die by firing squad. He was on death row for three months. While in the cell with others on death row, he catechized them and prepared them through the sacraments for their coming death. When his name was called, he left the cell ready to die for Christ, but at that moment, his death sentence was commuted to ten years in Soviet labour camps. He spent most of his years working in the coal mines of the Vorkuta region above the Arctic Circle. Accused of inciting a strike among the prisoners in the fall of 1953, he was transferred to a most severe prison in Vladimir, near Moscow. After protesting his innocence, he was sent back to Vorkuta. When his prison sentence was completed, he was sent to Lviv. He became instrumental in organizing the underground church. Some called him the Father of the Underground Church. His apartment became the centre of church activity: Divine Liturgies, administering the sacraments, catechesis, preparing seminarians, counseling and the like. He also began to organize religious sisters, even though the monasteries were official closed, and taught them a new way of living out their monastic and religious life. Many a vocation was fostered by Father Vasyl’s guidance and care. In 1959 Rome appointed Fr. Vasyl to be bishop of this underground church. Unfortunately there were no bishops in Ukraine who could ordain him. In 1963, Metropolitan Josyf Slipyj was released from 18 years of Soviet labour camps to attend the Second Vatican Council in Rome. While in Moscow, he called Fr. Vasyl to come immediately to his hotel room in Hotel Moskwa. When Fr. Vasyl arrived, Metropolitan Josyf began the Rite of Ordination to the episcopacy. The secret ordination finished and Metropolitan Josyf was taken to Rome. Bishop Vasyl returned to Lviv to do his episcopal work. On January 27 of 1969, Bishop Vasyl was again arrested. He was accused of anti-Soviet agitation in a book he wrote on The Icon of the Mother of perpetual Help, for listening to Vatican radio and for baptizing people. He was sentenced to a three year prison term in Komunarsk in Eastern Ukraine. There he underwent chemical, physical and mental torture. The Soviets attempted to extract information from him about the underground church but were unsuccessful. Near death in 1972, he was released from prison and was exiled from Ukraine. Metropolitan Maxim Hermaniuk invited Bishop Vasyl to come to Winnipeg, Canada in June, 1972. Overcome by the tortures and death causing drugs he received while in prison, he died a martyr’s death on June 30, 1973. After the funeral services in Sts. Vladimir and Olha Ukrainian Catholic Cathedral, he was buried on July 5 in All Saints Cemetery near Winnipeg. After Blessed Vasyl was beatified by Pope John Paul II, preparations began for the exhumation and enshrinement of his holy relics. His holy body was exhumed on September 16, 2002. Following Vatican protocol, it was examined by a team of doctors and church personnel. His holy body was found to be fully intact with all its muscle mass. His holy body was revested with new vestments and placed in a stainless steel sarcophagus. On September 22, 2002, his holy relics were enshrined in a chapel in St. Joseph’s Ukrainian Catholic Church in Winnipeg, Manitoba, Canada. Pilgrims come and pray before Blessed Vasyl , seeking his powerful intercession. On July 20, 2014 during the All-Ukraine Pilgrimage to Zarvanytsia, Ukraine, Patriarch Sviatoslav solemnly proclaimed Blessed Vasyl to be the Patron of Prison Ministry for the Ukrainian Greek Catholic Church.